ASHOK SEWNARAIN is an accomplished businessman with interests in the property and hotel industry in South Africa and abroad. 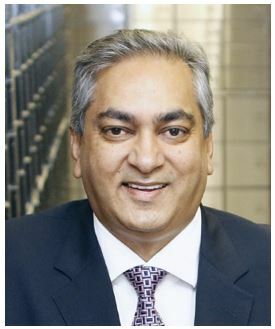 Sewnarain is the owner of South Africa's first privately owned safe deposit vaults, located in Durban's Gateway Mall and in Sandton, Johannesburg. Sewnarain was born in Mayville, an Indian-designated area in apartheid South Africa. His father ran a small, often struggling, estate agency and taught his son to never give up. When Sewnarain took over the family business, he injected new ideas into it, expanding into the hotel and hospitality industry as the barriers put up by apartheid were dismantled. "It was around 2004 when I overheard a bank teller saying that there is a long waiting list of people who wanted to put their valuables in the bank's vault. I jokingly said that I will build my own vault," Sewnarain says with a wry smile. After he left the bank, Sewnarain began to seriously think about opening a vault. He did extensive research, which took him to other countries to look at how the vaults are constructed, the finance involved, security features and a host of other things. He found that there is substantial demand for such sophisticated facilities. In May 2005, Sewnarain opened the first private vault, in Umhlanga's Gateway Mall. "We choose the best malls and prime spots for our vaults. Our first site was selected because of its proximity to some of the most significant business and residential developments in KwaZulu-Natal. Also, the layout of the Gateway complex facilitates International Bank Vaults' strict security standards," Sewnarain says. "It's a risk to have a safe at home because many people have access to your home. We offer a solution, and peace of mind. We add value to the country in a sense that people can safely keep their gold and other assets in the country instead of sending them offshore." International Bank Vaults offers safety deposit boxes in modern-day fortresses. The vaults are built to international standards and specifications, complete with steel-reinforced concrete and protected by a sophisticated, multitiered security system. They are monitored by trained professionals and open 24 hours a day, seven days a week, 365 days a year. Sewnarain subscribes to the philosophy that says one should persevere and be determined to pursue ones dreams in whatever business that one chooses. He says, "Business is full of risk and challenges that we must confront on a daily basis." He added that he has had many failures in his business career, but all have made him more knowledgeable and humble. "Humbleness takes you everywhere. Arrogance will take you nowhere." However, Sewnarain says, "You must be bold and have courage to launch business ventures with honesty and respect for staff, customers, suppliers and service providers." His motto is, "Fear no-one, respect everyone." "Life is about dreaming big," Sewnarain said recently. "Dream to make a million dollars, rather than a million rand. The most successful people in the world dream big. It's free. It has no boundaries and borders," he explained. International Bank Vaults' customers have special, reserved parking close to the facilities and many of them drive exotic cars. The IBV Supercar Club has spun off from the vault business; has a membership of more than 700 super-rich car owners and is recognised as one of the world's leading supercar clubs. Sewnarain is its founder, leading patron and chairman. The members of the club often raise funds for charity. In 2014, they won the Guinness world record for raising R1 million for Child Welfare of South Africa in record time. The club has also partnered with the United Nations Children's Fund Unicef in raising money for charity. Sewnarain commented that he tries to create a balance between good business and profit through providing community and social support. This balance is achieved by promoting a spirit of social entrepreneurship, which he believes is an important aspect that every business leader should adopt in their own enterprises. He concluded, "The more that you give the more that you get."